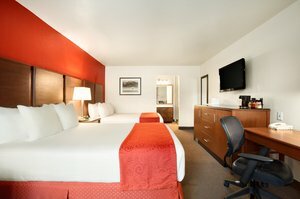 Enjoy a relaxing getaway in our hotel rooms in San Diego, CA. 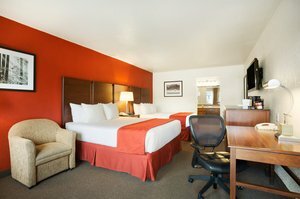 Each featuring a tasteful, modern design, you’re sure to rest easy in any of our hotel’s comfortable, affordable guest rooms. Our San Diego hotel rooms & suites have been designed with our guests in mind, each featuring soft, lush beds, and thoughtful in-room amenities. Take in beautiful views of our property in one of our Courtyard Rooms! 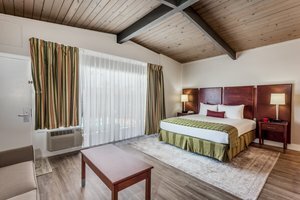 These hotel rooms in San Diego come equipped with two queen beds, perfect for a group getaway, or a single king, ideal for a romantic getaway! Guests traveling to the area on business will enjoy a night’s stay in our Business Class Two Queen Room, which gives guests a little bit more space during their San Diego work trip. Our accommodations in San Diego are stocked with a ton of in-room amenities designed to make your stay with us as comfortable and convenient as possible. Enjoy complimentary Wi-Fi, flat-screen TVs, and a work desk in each room! Spend the day in the beautiful California sun at our outdoor pool, or work up a sweat in our fitness center. Guests can also stroll down to our onsite restaurant, Proud Mary’s Southern Bar & Grill for a delicious meal and some live music! 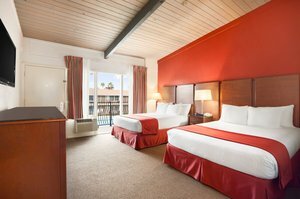 Book your stay in one of our charming hotel rooms in San Diego, CA today to enjoy a relaxing Southern California getaway at an affordable rate! The Ramada Hotel & Conference Center San Diego is a non-smoking hotel. 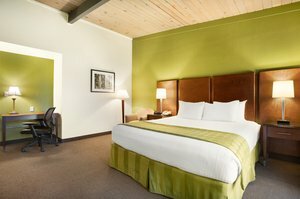 Our Business Class King&nbsp;is uniquely designed to accommodate business travelers and those looking for an elevated stay in San Diego. With a generous amount of living space and the addition of a queen-sized sleeper sofa, this room can comfortably&nbsp;house up to 4 guests. Spend your days enjoying our dynamic property, which is expertly designed to meet your every need.